The Army has quite a few of these desalinization machines, and the big bags (foreground) into which they can put the purified water. 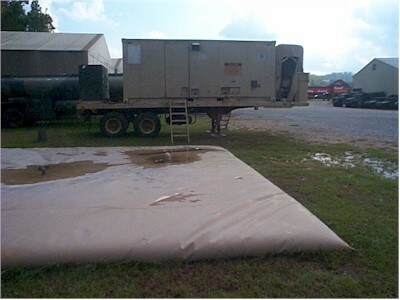 This trailerfull of equipment can purify up to 3,000 gallons of water per hour. The bags come in different sizes - 3,000/10,000/50,000 to name a few. The bags are quite strong: I walked on top of one without making much of a dent at all. This bag is broken, I think, which is why there's a bit of water on top and off to the right of it. Desalinization is very important in some of the more strategic regions of the world, and may become more important here, as supplies of fresh water decline during the new millenium.